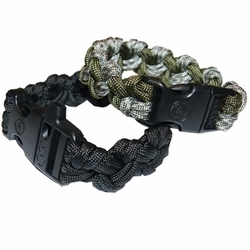 Ultimate Survival Para 550 Multi-Purpose Paracord Bracelet. These heavy-duty paracord bracelets are ideal for lashings, snares, shoelaces and first aid – the uses are endless! Available with regular clasp or with a a high-decibel whistle/clasp combination. Weight - Basic: 0.8 oz. | Bracelet w-Whistle: 1 oz.